SUP (stand up paddle board) Yoga is just what you see – yoga practiced on a stand up paddle board in the sea! Combine the SUP surfing with Hatha yoga asanas (poses) and you’ll get a fun and strong challenge with lots of laughter! 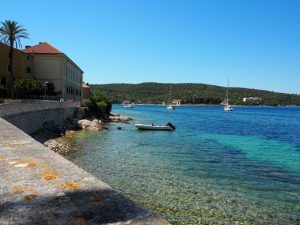 Combine this with a week in Croatia, one of the most desired travel destinations in Europe and have a SUP yoga retreat to remember! Yoga on a paddle board not only challenges the physical practice by incorporating a strong sense of balance, but also brings in the mental challenge of focus, release, and tenacity. 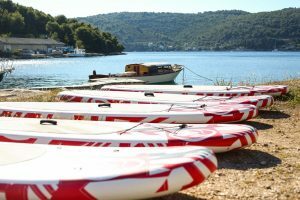 An active, challenging and crazy fun SUP yoga holiday – it’s a week in a Villa situated on the island of Vis with breath taking views over the sea, yoga (SUP and land) and active travel. 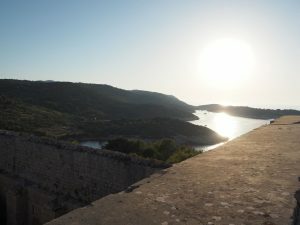 As well as with healthy vegetarian food, island summer parties under the sky, tastings, new friends and much more. The island charms with its natural beauties – rugged coast around the island, dotted with gorgeous coves, caves and a couple of sand beaches. 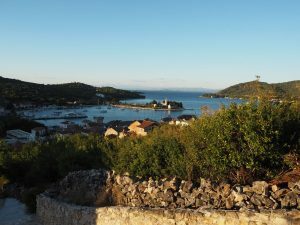 As well as crystal clear sea, surrounding islets and a spectacular green inland. Even if you’ve never tried SUP yoga – do not worry, you will quickly get a handle on it! Yoga classes at the retreat are suitable for everyone – from a beginner to a longer practicing yogi. We will have our morning stand up paddle board yoga sessions on the SUP boards – peaceful and calm waters will help build your confidence day by day and you will sense a big difference in your yoga practice at the end of the week. Our afternoon land yoga classes will focus on restorative and yin yoga to help you unwind after the day. We accommodate our guests in a beautiful Vis town villa that is located uphill from the town’sbay and only 5-minute walk from the center and 10-minute walk from the beach. 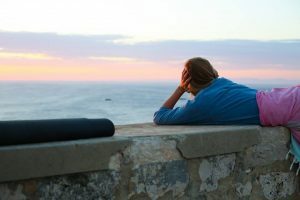 With an amazing view to the town and the Vis bay as well as a pool and large terraces the villa is a great place for this active yoga holiday. Breakfast and dinner will be served in the outdoor dinning areas or in the indoor dinning room in case of bad weather. Enjoy your down time on the large terraces, by the pool or in modern and fully equipped rooms. With the town just minutes away you can always come down for a cup of coffee or a stroll on the beautiful town promenade! Each room has its own bathroom and air conditioning. Air Conditioning; CD Player; DVD Player; Radio; Satellite / Cable; Stereo; Television; Laundry room. 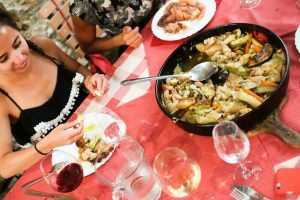 Dinner – meals cooked at the villa. All of our food is vegetarian, vegan or raw. We use a lot of locally grown seasonal fruit, vegetables, spices and herbs as well locally produced olive oil, cheeses and other goodies. Healthy nutrition is a very important part of healthy lifestyle. That’s why we pay a lot of attention and time in preparing it and serving it fresh and delicious for you. 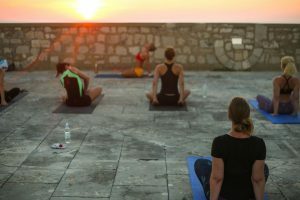 During the balance yoga retreat we’ll invite you not only practice SUP yoga and meditation, but also explore the beautiful and unique island of Vis. These are the tours we’re inviting you to! We can also offer additional tours and activities during your yoga holiday, the options will be presented at the location. Srebrena – breath taking beach.